← Torah obedience = blessing. The “Great American Eclipse” is a scant two weeks away and I have been pondering it a bit. This morning, I shot a quick two texts to my good friend and co-author, Al McCarn. He answered almost immediately with three links I will share in a minute. 14 Then God said, “Let there be [s]lights in the [t]expanse of the heavens to separate the day from the night, and let them be for signs and for seasons and for days and years; 15 and let them be for [u]lights in the [v]expanse of the heavens to give light on the earth”; and it was so. 16 God made the two [w]great lights, the greater [x]light [y]to govern the day, and the lesser [z]light [aa]to govern the night; He made the stars also. 17 God placed them in the [ab]expanse of the heavens to give light on the earth, 18 and [ac]to govern the day and the night, and to separate the light from the darkness; and God saw that it was good. 19 There was evening and there was morning, a fourth day. Notice the created lights or luminaries of the sun, moon and stars are for 1) signs, 2) seasons, 3) days and 4) years. Most people understand the third and fourth functions of the sun and moon. Day, night. Easy peasy, right? Reading the passage in English makes most assume they understand the second, ‘seasons’ but in fact, the Hebrew does not refer to Spring, Summer, Winter and Fall. Rather, the term refers to appointed times that are severally introduced in Scripture, but best summed up in Leviticus 23. Those ‘appointed times,’ or ‘moed,’ are Pesach (Passover), Unleavened Bread, First Fruits, Shavuot (Pentecost), Yom Teruah (Trumpets), Yom Kippur (Atonement) and Sukkot (Tabernacles), all Feasts of the Lord. However, this use is not the subject of this post. It is the first use that we will briefly consider today. That use is ‘signs’ or ‘oth’ as in ‘signal, beacon, banner, omen,’ etc… The heavens are an incredibly designed complex group of moving parts that tell a story, send warnings and reveal exact timings. The Creator of Heaven and Earth who knows all and has an exact plan already set forth in time and space has written the very details into the sky. While it would take volumes to build that out and demonstrate examples, the simple fact is that not a single celestial event is wasted and all have some significance in revealing the Heavenly plan, though some signs are much more obvious than other. Over the course of the last several years we have had a rather rare sequence of Blood Moons that fell on consecutive Pesachs and Sukkots the subject of multiple posts on this blog. More recently, we have looked at the impending fulfillment of Revelation 12:1-2 in the sky. 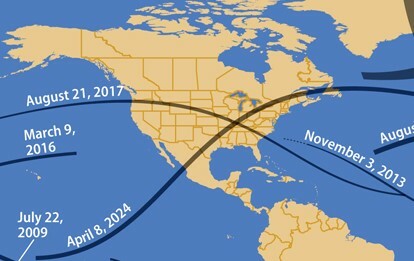 Tracks of the two eclipses form a giant X over the US…. Interesting series of facts and imagery, no? This eclipse occurs on the eve of Elul 1, which traditionally begins the significant 40 day period of repentance before Yom Kippur, prompting my question to Al about Jonah. The message Jonah spoke to Nineveh was, “40 days more and Nineveh will be destroyed.” Judgment and destruction is connected with Yom Kippur, the Day of Atonement, therefore, it would make sense that Jonah’s message would be supported with the universal sign from heaven of impending judgment, a total solar eclipse. Interestingly, NASA records that just such an event occurred on June 15, 763 BC with a total solar eclipse over Nineveh during the reign of King Ashur-Dan III, a contemporary of Jonah, as this article from WorldNetDaily recounts. June 15th would fall weeks before Elul 1 and the 40 day period of repentance. Were the Ninevites prepared for Jonah’s message? Jonah ministered exactly during this timeframe, even leaving the city at the end of the 40 day period and building a sukkah (sukkot, tabernacles, ?? anyone?) to observe the city from. This is interesting timing and imagery tied to the Jonah story that may have bearing on today and the sequence of events setting up both in the sky, in Washington and the state of the world. My greatest concern is that the whole event has sparked a massive party atmosphere in the United States. Yes, it is rare, and yes, it passes directly over my house in South Carolina, and yes, I am interested in viewing this event, but, does it portent judgment and are we repenting? Personally, I think not. In fact, I believe America is celebrating her debauchery as much as we are celebrating the impending omen of judgment. To bring the lesson closer to home, this morning I watched a terrific teaching video by Steve Moutria of Torahfamily.org titled Where are the Weeping Prophets? I HIGHLY recommend investing 30 minutes for this very important message from the Father concerning how we are reaching out to others and how we should be reaching out. Steve encapsulates in a captivating manner some of the very stumbling blocks that we are and have that prevent others from hearing our message. Now is the time to begin preparing our hearts for Elul and serious repentance on our own behalf and that of our nation. Ours, and their future may depend on it!! This entry was posted in A Thought... and tagged great American eclipse, Jonah, judgment, Nineveh, solar eclipse, United States. Bookmark the permalink. And all shipmasters and seafaring men, sailors and all whose trade is on the sea, stood far off 18 and cried out as they saw the smoke of her burning. It would fit that verse nicely. This is just a what if.. … again its always does my heart good to see your e-mail. Yes, the cauldera at Yellowstone could change the world and it appears to be waking. May play into this whole shift that is coming. Thank you for the kind words. I hope to get back to writing regularly. Have spent the last few months remodeling parts of this old house and co-authoring a second book with Al. Now looking for a publisher and how to promote it. Tired and busy, but Abba is good. Thanks again, Pete and Travis. Yellowstone may well be a player. It can bring major death and destruction to the northern hemisphere. I really don’t believe this is about to blow however it does seem ever time I turn around I find another article on it and I’m not googling it. Its fun to what if. Kinda of like watching a scary movie. This was on Friday’s Drudge report. I think it is nothing but sensational journalisms to sell more papers. Even among my Christian friends there seems to be a disbelief that any harm will come to them or America. I’ve not even mention yellowstone. A sense that everything will keep on keeping on so to speak. Without some fear or sorrow can there be repentance? I do have a question. Does the 2nd Exodus occur before or after we are called in the air to meet Christ? If before then who is called in the air if after then why are we called in the air? I have come to understand Paul’s statement about meeting Him in the air to be his understanding of Due 30 and Matt 24 where Moses and Yeshua both speak of gathering from “the four corners of the sky.” The Due. passage is gathering TO the land. How it works out? Not sure exact timing, or how it relates to the second exodus, but it all works out. It won’t be the Christian idea of being snatched to some other world/realm. thanks will study those passages. Have you ever consider getting on Facebook or twitter? I’m on my wife’s Facebook, but haven’t considered twitter…. email me for her Facebook name.